“Abyssinia, Henry,” the 24th episode of Season Three and the 72nd overall, was originally broadcast on Tuesday, March 18th, 1975. In addition to the opening and closing credits, the episode included eleven songs, several of which were hummed by members of the cast. What follows is a breakdown of all of the music heard in the episode, taken from the official cue sheet prepared by the Twentieth Century-Fox Film Corporation legal department, dated February 6th, 1975. As the episode begins, Trapper asks Hawkeye to identify a sung that he is humming. Hawkeye guesses “Avalon,” which was incorrect, and then “In a Little Spanish Town,” which was correct. The humming itself is titled “Trapper Hums” and was an original composition by Benny Golson and published by Fox Fanfare Music, Inc.
Father Mulcahy then hums a few bars of “Oh Shepherd, Guide Thy Flock,” a traditional song in the public domain. Trapper incorrectly guessed it was “On Wisconsin,” the fight song of the Wisconsin Badgers at the University of Wisconsin–Madison. After Radar brings news that Colonel Blake will be going home, everyone congratulates him. Father Mulcahy tries to get everyone singing “O Shephard, Guide Thy Flock” but only manages to get in two seconds according to the cue sheet. Instead, Hawkeye and Trapper and others begin singing “On Wisconsin,” written by Purdy/Beck and published by Edwin H. Morris & Co.,Inc./Paxwin Music Corp.
Later, Colonel Blake calls Lorainne, his wife, to give her the good news that he’ll be coming. After they get cut off, Radar whispers to Hawkeye that Lorainne has “a fantastic body.” As Colonel Blake and Hawkeye react, a piece called “A Fantastic Body,” composed by Benny Golson and published by Fox Fanfare Music, Inc., is played in the background. It cannot be heard well due to the laugh track. Colonel Blake, Hawkeye, Trapper and Radar have a traditional Korean dinner at Rosie’s Bar. In the background a song called “Koto Talk,” composed by Benny Golson and published by Fox Fanfare Music, Inc., can be heard. It plays for three minutes and forty seconds. Following the dinner, Hawkeye, Trapper and Radar surprise Colonel Blake with gifts. They’ve collected three South Korean women who hum “America the Beautiful,” a traditional song in the public domain. The humming lasts for one minute and nine seconds. The next morning, Frank forces Radar to play “Assembly” on his bugle. It is a traditional song in the public domain. Radar plays for nine seconds. Hawkeye suggests Henry give Margaret a going away kiss. He does so and everyone begins clapping and cheering. Radar plays four seconds of “Reveille” on his bugle. As Henry begins the walk to the chopper pad, the collected members of the 4077th sing “For He’s a Jolly Good Fellow,” a traditional song in the public domain. Following the tag, in which Radar comes into the O.R. 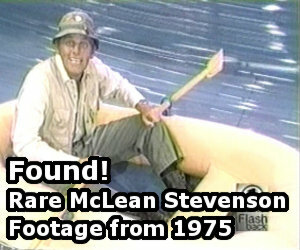 without a mask to reveal Henry’s death, a montage of scenes featuring McLean Stevenson are shown. In the background is a song called “Memories of Henry,” composed by Benny Golson and published by Fox Fanfare Music, Inc. It lasts for just over a minute. Following the end credits is the 20th-Century Fox identification/trademark. It was written by Alfred Newman but I’m not including it here.